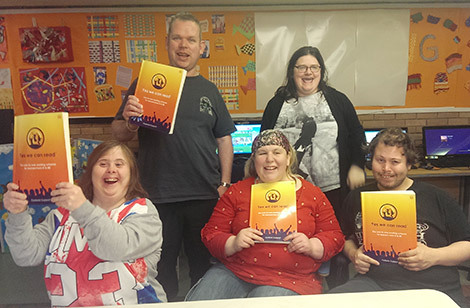 Goldhay Arts is a registered charity offering weekly sessions in the performing and visual arts to adults with learning disabilities since 1994. Our aim is to provide a quality service with an emphasis on personal development through experience of the performing and visual arts. To place before all other considerations the welfare and development of members and all those who use Goldhay Arts. To work as a team, providing mutual support and shared decision making. To strive towards a standard and quality of work that will challenge assumptions as to what people with learning disabilities have to contribute. To encourage access within the wider community through the development of necessary skills, supported integration and through Goldhay Arts artistic programme. To recognise the needs of carers and encourage commitment and understanding through close liaison and support. To work closely with other providers of services for people with learning disabilities, sharing best practice and continuing to improve standards. To work in partnership with a wide spectrum of arts and community organisations. To work toward rewarding progression for members as they move on. To ensure that Goldhay Arts Company does not discriminate against people because of their race, colour, religion, age, gender, sexual orientation, class, disability or culture.